Look no further—the perfect vacation starts at Splash resort! Offering the most amenities on the Gulf Coast, Splash is a kid's paradise! This 20th floor luxury unit at the Splash resort is the ideal destination for families. 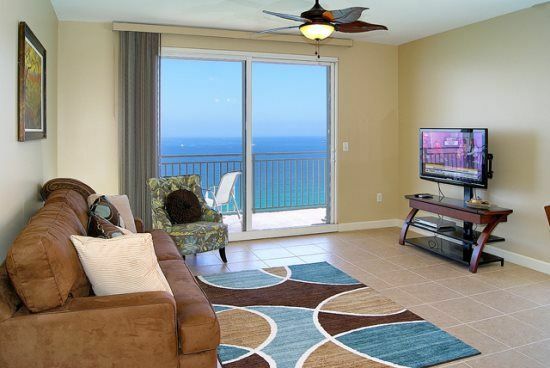 Wonderfully positioned beside the turquoise waters of the Gulf of Mexico, this beautiful 3-bedroom condo at Splash offers fun, relaxation, and spectacular views. An end unit, this condo works great for two families. Kids of all ages will love the water theme park environments, including a beachfront lazy river, multiple pools, a splash pad, children's interactive play pools with water slides, water cannons, disappearing walls, dive-in movie theater, and many interactive water toys. Your kids will have to see it to believe it. There's even an arcadey! Mom and Dad will also love Splash—and not just because the kids are having a ball. There's an adult only swimming pool and jacuzzi, with a birds-eye view of the kids play area, a state of the art fitness facility overlooking the pool and lazy river, a poolside bar and grill, high-speed Internet access in the common area, and onsite beach apparel and surf shop. With a fantastic front beach road location and easy access to Pier Park shopping, movies, and restaurants (approximately 2 miles away), there's a lot of fun for the whole family. Book today, and let the vacation countdown begin! Note: Weekly rentals in season, requires a 7 night rental with Saturday arrival and Saturday departure. We enjoyed our stay at Splash resort, we felt condo could of been cleaner and appears to run down. Blinds were tattered in every room which for people with young kids was annoying in the morning. Overall though great experience but would suggest attending to maintenance and giving condo a good thorough cleaning. This condo unit is a great size for large families. Overall, we really enjoyed our stay, but I would recommend that the owners hang some curtains in the bedrooms. Each bedroom only has vertical blinds (some were damaged), so the rooms are extremely bright by 6:00am. The property is perfect for young kids since it has the splash pad and water slides. Great condo very large and spacious! IF YOU HAVE KIDS THIS IS THE PLACE TO BE! We loved it here st Splash. The grand kids had a blast! The place was perfect for us. Very Clean and amazing views. Splash resort is great and there is so much to do around the area.